This position is from the "Cup of Governor" or the 6th Femida Tournament which I think is some kind of superleague in the Ukraine. It was four teams on four boards playing a round-robin. Some top players included Ponomariov, Eljanov, Jobava (all rated 2700+) and some very strong Ukrainians like Korobov, Volokitin, Miroshnichenko and Moiseenko. In the diagrammed position, former FIDE World Champion Ruslan Ponomariov just played 30.Qb3-d3?? 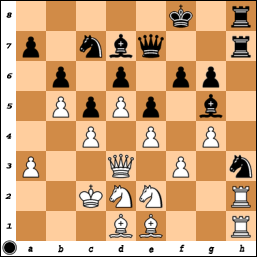 allowing Jobava Baadur with black to hit him with a nasty tactic. Jobava won all his 3 games which should mean he should be very close to a career high in rating (he also beat Eljanov!). Jobava played 30...Nf2! and Ponomariov had to give up the exchange with 31.Bxf2 and suffer while Jobava brought home the point as 31.Rxh7 fails to 31...Rxh7 32.Rxh7 Nxd3 32.Rxe7 Nxe1 which is also check, leaving black a full piece up after he captures the rook on e7! I like the blog! I'll be back- Thanks!